Are your teeth stained or crooked? If so, Crestridge Dental in Burnsville, MN provides veneer services to patients throughout the area. Veneers are thin pieces of porcelain or plastic cemented over the front of your teeth to change their color or shape. Little or no anesthesia may be needed and they have a longer life expectancy and color stability than bonding. They are more resistant to permanent staining from coffee, tea, or even cigarette smoking. Preparation – teeth are lightly buffed to allow for the small added thickness of the veneer. Usually, about a half a millimeter of the tooth is removed, which may require a local anesthetic. During the same visit, a mold is taken of the teeth, and sent to the laboratory for the fabrication of the veneers. Bonding – veneers are placed on the tooth surface with water or glycerine on the teeth to check their fit and get a sense of the shade or color. While the veneers are resting on your teeth, they can be adjusted with various shades of cement to match the color of your teeth. To apply the veneer, the tooth is cleansed with specific chemicals to achieve a bond. Once special cement is sandwiched between the veneer and tooth, a visible light beam, or laser, causes a catalyst to be released, hardening the cement. Call Crestridge Dental at 952-892-5050 to schedule your next appointment or consultation. 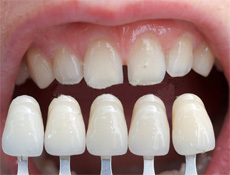 For more information on veneers, please visit: http://www.mouthhealthy.org/en/az-topics/v/veneers.